Since the 1930s, it has been producing components and speakers for high-end entertainment system, and recently Vifa has been producing its own devices of a new kind - wireless speakers. One of the most interesting designs I have had the pleasure (with a clear emphasis on the word) to test is the Vifa Copenhagen speaker. Let me start with the most important factor, that being the sound quality. I must admit that I am rather skeptical about wireless speakers that are housed in just one box. Such devices will never replace well-positioned loudspeakers providing adequate sound. Wireless speakers that play only from one point create some limitations in perception. That being said, the quality of sound that came from the Vifa Copenhagen loudspeaker resulted in immediate jaw-dropping on my part. The speaker plays a full-band sound, with very clear middle frequencies, not too intrusive -- but clear -- bass, and high notes that are pleasant to the ear. The sound is natural and uncompressed and the individual instrument lines are not crammed together like sardines in a tin. When I turned it on the Copenhagen Vifa for the very first time, I reveled in the beauty of the sound for a few hours. The Copenhagen Vifa is perfectly suited to all kinds of music. I listened to smooth jazz, film soundtracks, electronic, rock and metal (mostly Scandinavian death metal). Listening to music coming from that speaker is pure pleasure. Additionally, thanks to an iPhone application one can alter the characteristics of sound emitted by the loudspeaker. There are all sorts of settings, like a night mode for listening to music at a very low volume level; bright, with a high frequency boost; party mode or high-pass filter. The characteristics of the sound can also be adapted to the place in which the speaker was set (eg; the desk at which I work). Personally, however, the default settings suited me best. The sound is good enough that there is no need to tinker with it. Of course premium, quality sound doesn't come out of nowhere. The device has very good components made by Vifa -- two 28mm tweeters, two 50mm midrange drivers, and four 80mm woofers powered by four passive radiators. With all of those speakers, the device weighs 10.25 pounds and although it is a wireless speaker equipped with a handle, it is rather hard to call it a mobile device. Scandinavia produces not only great sound, but also incredible design and that is where the Vifa Copenhagen shines as a masterpiece. It embodies not only Scandinavian coolness, but the warmth of a woolen hat and scarf. The device is in fact coated with a woolen blanket woven by the leading Danish textile manufacturer Kvadrat. The whole device is enclosed with an aluminum frame that creates a large handle for easy moving (though as mentioned, it is not a mobile device). On the front are just two volume control buttons and a LED device state indicator, all hidden under a blanket. I can not help but associate it with the design aestethics of Dieter Rams. As befits a wireless speaker, the Vifa Copenhagen has a built-in battery. Its capacity, however, is only sufficient for about five hours of operation. Given the weight, design and price, I wouldn't treat this speaker as a boombox that I could take on a picnic or a walk. For me, it's definitely a desktop loudspeaker that's perfect not only for a desk, but for the living room as well. I would therefore plug it permanently into an electrical outlet and not be worried about the battery level. 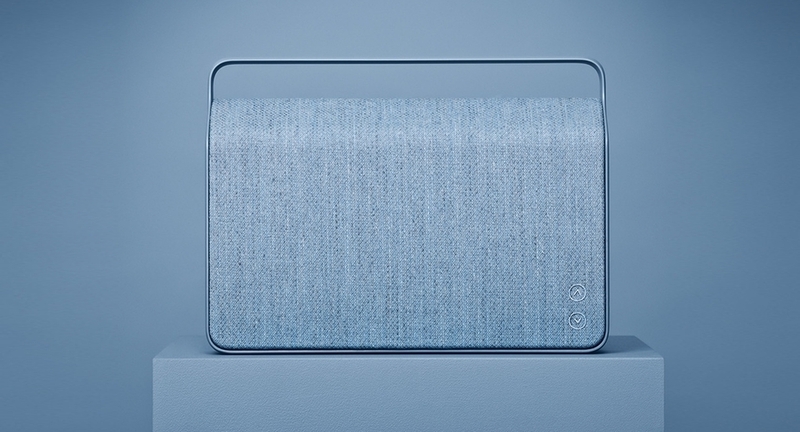 The device can be connected via Bluetooth (aptX), Wi-Fi Direct (Vifa Copenhagen creates its own network) or connected to a local Wi-Fi network and used via AirPlay. It can be also connected to a sound source by a cable plugged into a mini-jack socket found on the back side of the device. There's also a USB port for digital audio streaming. Vifa Copenhagen is a product that certainly will be appreciated by people who value good sound and style, but who cannot afford - probably not due to financial constraints - to set up a regular stereo with separate loudspeakers, subwoofer and amplifier. The device's minimalistic design pleases the eye, and at the same time provides the pleasure of listening to really good quality sound. For both, however, you have to pay a premium price. Copenhagen Vifa costs roughly $800 (you can find it on Amazon), but this price tag should not come as a surprise. For this price, you'll receive the best sound quality, materials, components and a decidedly unconventional design.